Canadians are usually pretty nice folk... Until you disrespect their signs. Then it's no more Mr. Nice Canada. Canada takes holding escalator handrails pretty seriously. Next time you visit America’s neighbor to the north, it might be wise to pay attention to warning signs and heed their advice, especially in the presence of law enforcement. 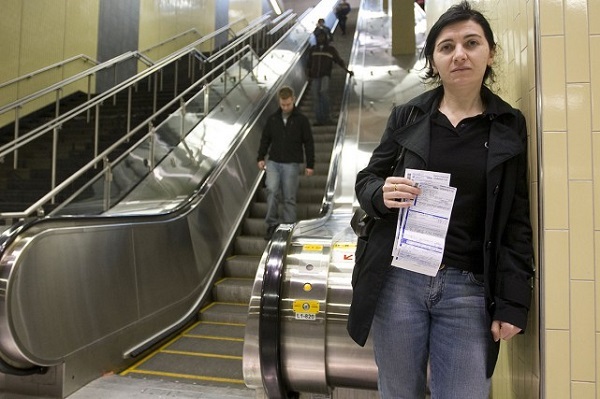 Bela Kosoian was in the Montreal suburb Laval Metro Station in 2009 when she was stopped by a police officer, advised to “respect the pictogram” that read “hold the handrail”. Refusing to follow instructions lead to her being detained by the police officer and another who arrived as backup. Reports say she was “taken by force” and detained for about 30 minutes before letting her go with two hefty tickets. One $100 ticket for disobeying a pictogram and one $320 for having obstructed the work of an inspector. The police officer claims things escalated after Kosolan refused to identify herself. She was acquitted of the two infractions in 2012 by Montreal municipal court and immediately filed a $45k lawsuit against the Montreal Transit Corp., the City of Laval and one of the officers, Fabio Camacho. Her suit was rejected by both the Quebec court and the Court of Appeal in 2017, to which the court claims Kosolan was the “author of her own misfortune”. But that doesn’t deter Kosolan’s lawyer. “This is excellent news,” said Aymar Missakila, Kosolan’s lawyer. He said the Court of Appeal ruling created a dangerous precedent. “A police officer who has a sincere but false belief that a law exists and decides to punish a party on the basis of this law could be exonerated of all responsibility …. It goes squarely against important principles of law,” he said. So let that be a lesson to all you would-be escalator hooligans. “Respect the pictogram”.